Dr. Jim Hines wants to eliminate Common Core education standards in Michigan and doesn’t think an infusion of new money will help the state’s schools. Bridge Magazine interviewed Hines, a Saginaw obstetrician, for more than an hour last week along with its partners in the Detroit Journalism Cooperative: Detroit Public Television, Bridge Magazine, Michigan Radio, WDET Radio, New Michigan Media and Chalkbeat Detroit. What follows is a transcript of Hines’ interview. Any grammatical and spelling errors are those of the transcription service. Christy McDonald, Detroit Public Television: We want to welcome Dr. Jim Hines, Republican candidate for Michigan governor. Thanks so much for taking part in our gubernatorial candidate interviews. I’m Christy McDonald with Detroit Public Television. In the room today, and doing the questioning, are members of the Detroit Journalism Cooperative. The DJC is made up of six media outlets: Detroit Public Television, Bridge Magazine, Michigan Radio, WDET Radio, New Michigan Media, and Chalkbeat Detroit. We’d like to thank the John S. & James L. Knight Foundation for its support on this project. Today’s panel includes, and we’ll start over here to my left, Erin Einhorn. She is the bureau chief of Chalkbeat Detroit. Riley Beggin, she’s the politics reporter for Bridge Magazine. Stephen Carmody, he’s a reporter and producer at Michigan Radio. Hassan Khalifeh, he’s a reporter with the Arab American News and New Michigan Media, and to my left, Sandra Svoboda with WDET Radio. So for the next hour, each journalist will ask a series of questions and follow up on your answers if they need some more specifics. We do appreciate you keeping your answers concise so we can get to as many topics as possible. I will give us a 30-minute time reminder so we can all keep track of where we are in the hour. So let’s go ahead and get started. Christy McDonald: I’m going to start off with the first question and really take a look at leadership and responsibility. Much has been made of the management style of previous governors, a de facto head of the party with strong armed tactics of getting things done to our current governor who’s been criticized for not being as politically savvy as he needed to be. First of all, explain what your management and leadership style is. Christy McDonald: What do you think of the word compromise? Jim Hines: I think compromise is a word that is utilized a lot, and it’s feared by many because what it means is taking your beliefs and your thoughts and meshing them with somebody else. But when you’re on a board, you have to forget the politics and you have to figure out what the problem is and what the best way of solving that problem is. It’s not just what you think, but it’s what the group comes up with to get something done. You have to get something done. And so, if you’re obstinate and you insist on your specific way--it has to be my way or the highway--that’s not going to work. Christy McDonald: How do you see your role if you become governor? Do you see yourself as the de facto head of the Republican Party, and would you be in lockstep of whatever the Republican agenda would be in the state of Michigan? Christy McDonald: Would that put you in a clash with Republican leaders who say, “Look. We want to get this done, and now you’re in the governor’s office. And you’re in the position to do that, and you need support from Republicans in the House and in the Senate to do it”? Christy McDonald: Okay. Let’s go ahead and take a look at another topic that many people around the state are talking about: education. You said it’s one of the top three things that people have on their mind when they come up and talk to you at all the places that you’re visiting around the state. And I’m going to go over to Erin Einhorn for our first questions about education. Jim Hines: The question of funding--the problem that we have can’t be solved by money. If we look at the last seven years, we’ve had an extra $1.8 billion pumped into education, and our reading scores are worse than they were before. So money is not the solution. Although, in the educational part that we’re talking about, I believe we do need more funding, particularly for training teachers in how kids learn to read and looking at the variety of means that kids learn to read. Erin Einhorn: Okay. Given that the test scores are often driven by socio-economic and other factors, do you think that the state’s current accountability system of measuring schools gives parents a fair and accurate measure of how our schools are doing? In addition to that, we know--I have seven sons. They all learn in different manners, and my patients, as they talk to me, there will be a mom that will have three children in three different schools. I’ll ask why, and they’ll say, “Because Joey learns this way, so this charter school is best for him. But this traditional public school is best for this one, and this one I’m home-schooling.” I see many parents choosing a variety of means of teaching their kids. Erin Einhorn: Should the state be involved in deciding when a school should be closed for poor performance? Christy McDonald: Steve, you want to go ahead and jump in with your question on Detroit Community Schools? Stephen Carmody: Yes. Detroit public schools, the largest school district in the state, recently released a facilities review report that found it will cost $500 million to upgrade school facilities to bring them up to current standards, but the state won’t let the district borrow money for renovations. What help, if any, should come from Lansing for this problem? Stephen Carmody: The question was about upgrading facilities, not whether traditional public schools or charter schools are better. To improve the quality in the traditional schools, we have to do something about the buildings, which are in bad shape. Should Lansing contribute at least something towards the physical upkeep of these buildings? Christy McDonald: Okay. Hassan, you had a question about charter schools. Hassan Khalifeh: Yeah. You already touched on the need for choice in the education system, but I wonder what you think about the need for reform in how charter schools are governed or funded. Hassan Khalifeh: Should money allocated for public schools be used to also fund charter schools? Christy McDonald: Let me ask you about something you said about Common Core. You said that we should get rid of the Common Core. Why? Jim Hines: As I’ve spoken to dozens and dozens of teachers and parents, what we see is we see teachers spending a lot of time, if not a majority of the time, teaching to the test. When you do that, that doesn’t prepare kids for other subjects that need to be taught. Teachers are complaining, and severely, that their students are not learning--they feel are not learning what needs to be taught, as a teacher in their opinion, what needs to be taught because they’re teaching to the test. Erin Einhorn: What can the state do about the high cost of child care and the lack of pre-school options for young children? Jim Hines: That’s a huge problem, and, frankly, I don’t know the solution to that. You have moms who would like to work but can’t work because they have children. In many situations, it’s Grandpa and Grandma that watch those kids so that Mom can work, Mom can get an education, so that works very well. I think that when you discuss--well, let’s set up a daycare center that the state is going to fund, I’m hesitant to start something like that. Erin Einhorn: So you don’t think the state should be subsidizing child care or funding pre-school in any way? Erin Einhorn: So you would end all of those programs as well? Christy McDonald: I want to ask you a little about governance structure. There’s been a lot of talk about the way that education is shepherded in the state with the state elected school board, and then the school board appoints the superintendent. And then the governor’s office doesn’t have a whole lot to do with it. It’s a different governance model than a lot of other states that are more successful at their education around the country. Sandra Svoboda: Yeah. I want to talk a little bit about higher education. Costs have, of course, gone up in the state. I’m wondering if you think that the costs of colleges and universities now are prohibitive and what you would do as governor, what you could do as governor, to find some relief from that. Jim Hines: I think the costs are huge. It’s large. It’s burdensome. There are many things that families can do to reduce those costs, and I think dual enrollment is a key. I had two of my sons who did dual enrollment. One started at Michigan as a junior. The other one started at Cedarville, in Ohio, as a sophomore. Sandra Svoboda: What about the universities themselves? You talk about the student side of things. What about the university administrations and the state? Jim Hines: I think that schools can cut costs. It’s interesting that it seems as though the higher the tuition, the more students you have applying to go to that school. Somehow, the higher the tuition, the better the school, and that’s not necessarily at all true. Computer education, I think, is important. What schools can do to cut down costs -- I think to encourage freshman to know what they want to study when they’re there and to promote summer school, to promote graduating in three years rather than four years. I think that’s a very important thing that has to be looked at, and children, kids, and moms and dads need to understand that if you get a major in this particular thing, there is a flood of applicants working towards that. When you get out, you might not have a job. I think a good example is ultra-stenography, the ability to do an ultrasound and to look inside someone. There’s a glut in the market, and so if someone comes to me wanting to know “Dr. Hines, what do you think about ultrasound versus x-ray versus CAT scans versus MRIs?” I have that ability to say, “Well, I wouldn’t do ultrasound because for every opening there’s ten individuals that can’t find a job.” I think schools partnering with the workforce to know what jobs are out there is beneficial in this area. Sandra Svoboda: I’m interested in what majors don’t have a link to jobs? Which ones would you have colleges eliminate? And you can’t say journalism. Sandra Svoboda: So we should eliminate math majors? Sandra Svoboda: Well, what subjects should we eliminate? If they’re not leading directly to jobs, if you’re looking at the course catalog at a university, what are you cutting out of it? Sandra Svoboda: Just not journalism. Jim Hines: Well, you could answer that. Christy McDonald: All right. Let’s move on. Before we turn to some more policy specific questions, I want to ask a little bit about the workings in Lansing. Michigan’s term limit will cause a mass turnover in this year in the Senate, especially the house. How challenging do you think the loss of institutional knowledge will be in Lansing, and as governor, how will you and your staff prepare to work with new law makers? Term limits are interesting. Should they be expanded and changed in the state of Michigan? I believe so. I think they’re too short, so I would recommend that we change them, perhaps do 12 or 14 years in the senate or 12 years in the house. And pick one or the other and actually dig your heels in and learn the material that needs to be learned in those areas while you’re in Lansing. Christy McDonald: All right. Let’s move on to roads and infrastructure. Riley. Riley Beggin: Anyone who drives Michigan’s roads knows that they’re bad. A task force says that the state needs $4 billion more just to maintain our state’s infrastructure. How should Michigan pay to fix roads, bridges and other water infrastructure? Jim Hines: That’s kind of a loaded question. If we look at just roads, they’re horrendous. They’re terrible. You can’t even read a book anymore while you’re driving--well, not while you’re driving, but while you’re riding down the road. I believe it’s possible to fix the roads without increasing the taxes, first of all. I’ll say that. I believe that every dollar designated to roads needs to be used for roads. I would propose that we take some of our income tax, 0.35% to be exact, $875 million, for two consecutive years and concentrate that money on cities, towns, and counties, not the trunk lines, but the counties, and try to get roads to the point where they’re in pretty good shape. I think that if we can do that and use material that will last a long time--when I was in France for a year, they are similar on latitude, similar weather conditions and salt conditions. Their roads do last a long time, and they use a different kind of material. I think that’s a reasonable thing to do. The pipes that we’re talking about replacing belong to the homeowner, and we’re helping them collect that money to actually go to do waterline, either lead or galvanized pipe replacement, $110 million. Lansing took 12 years to do all their pipelines, and that was about $44 million. So it’s expensive, but it has to be done. That would be a means to do that. Riley Beggin: I think we’ll ask you more about PFAS later on. I do want to follow up on talking about funding for roads. You said 0.35% of income tax will be used to fix the roads under your plan. Where are you expecting to make cuts in the rest of the budget from that general revenue source? Riley Beggin: So you’re saying roll back to pre-Granholm area income tax, but I’m confused. That amount of money that’s left over you’re going to use for roads? Jim Hines: So that amount of money coming in would be $875 million, so I’m suggesting that we use that for two years in a row. That’s $1.75 billion added to the $1.2 billion plus what we get back from federal and state. That’s about $5.7 billion per year, for two years, to get our roads in reasonably good shape and then deal with the personal income tax. Riley Beggin: I see. Okay. Jim Hines: Decrease from 4.25 to 3.9. Christy McDonald: Riley, did you want to follow up on a question on Flint? Riley Beggin: Yes. As the recovery efforts continue in Flint, what have you learned from the situation there, and how would that inform what you do as governor? I think the other is that we know that as long as there’s any lines that need to be changed out that there is always the possibility of a (undecipherable) of lead contaminated water getting in the water system and contaminating other individuals, other homes. It just seems a little crazy to me that we would tell the people of Flint that you have to drink bottled water until all the lines are out. However, then we take the bottled water away. I think there’s a conflict there that needs to be resolved. Christy McDonald: Let me go back to something that you said, that there has been $23 million spent in the investigation and the prosecution following the Flint Water Crisis. Are you saying that that prosecution and investigation should not have happened, that we should have not spent that money to find out and to backtrack what may have happened? Jim Hines: No, I’m saying that it’s great to hold people accountable, but we actually have very little to show for -- it’s way over $23 million. We need to change out the water lines. I think that the key is here not so much the fact that we’re prosecuting and defending everybody in Flint. But while we’re doing that, the water lines are not changed out. My emphasis would be on getting the water lines changed. Christy McDonald: Anyone else have a follow up on that? I have one quick follow up in terms of trust because people in Flint do not trust what the state government is telling them. A lot of them still don’t have that trust. How would you seek to rebuild people’s trust in state government? Christy McDonald: All right. Let’s talk a little bit about some more water quality issues. Steve? Stephen Carmody: Not surprisingly, a lot of people in our audience are very concerned about water quality, in particular, about the Great Lakes. We have a question from Laurie, and she asks basically, what are you going to do to safeguard them, our Great Lakes, as governor? Jim Hines: There’s no question that they’re being threatened, whether it’s invasive carp, and that will take a multi-state approach. Actually, acknowledging that there’s a problem and then dealing with it, looking at it with other states. When you look at the 23 million gallons of oil that we’re pumping through the Straits in a pipeline that’s 65 years old that has dents in it, that’s bent, that doesn’t have the supports, it’s just a time bomb. And it will break just like the Kalamazoo line broke. Riley Beggin: You kind of touched on what my question was which was your plans for the future of Line 5. Let’s talk about how you would transport that oil. Do you think that that’s an important resource, and, if so, what would you do instead of Line 5? I think that that’s a reasonable suggest, but that will take years and years to produce. The question is do we actually stop the flow of oil and figure out where the oil is going to come from other pipelines for the state of Michigan and have an honest evaluation of what are our needs? There are two natural gas plants going in the UP. Does that meet the needs that we have? That would have to be looked at, but I would decommission the line. Riley Beggin: Are there any other energy resources that you’d be interested in investing in as governor? Hassan Khalifeh: Yeah. I just wanted to follow up on if you do have any plans to clean up the water contamination caused by industrial chemicals like PFAS? Christy McDonald: All right. We’re going to move on and explore the topic of immigration. Hassan has a couple of questions. Go ahead. Hassan Khalifeh: Yeah. Governor Snyder established the Michigan Office of New Americans in 2014 and declared June as immigrant heritage month this year. What would you do to attract more people to Michigan, given that we might loss a congressional seat given the population decline? And would refugees be a part of that plan? If you look at entrepreneurship and jobs, a high percentage of that comes from immigrants and refugees, very industrious peoples from all over the world. So we should foster that. We should encourage that. They can become active citizens of Michigan and Americans. We, of course, want them to learn our history and our language and assimilate into our culture. That’s all part of it, but I think it’s important and it needs to be done. Hassan Khalifeh: Do you believe that refugees are properly vetted, currently? Hassan Khalifeh: Okay. Would you support the EB5 visa program to attract entrepreneurs into the state and give them green cards? Sandra Svoboda: Moving forward a little bit on immigration concerns and issues, the 2020 census and the citizenship question that’s proposed for it, how do you see that impacting Michigan? Jim Hines: From what perspective? Sandra Svoboda: The debate has been over people not wanting to answer the census at all because that information is on there, or what the government would do with that information once they get it. Is that a fair characterization of the census, and how people are viewing it, and does the state have a role? It kind of speaks to the state’s role in immigration issues in the conversation that’s ongoing. Jim Hines: You know, I think there’s a group of people that are suspicious when it comes to what they would consider a large intrusive government, and I would support small limited government. If your concerns are “What are they going to do with this information? This is my private personal information,” then it becomes difficult to do a census. Maybe it might require someone walking around and looking and counting and that sort of thing. Christy McDonald: All right. Let’s move on to taxes and tax incentives. We’ll send it over to Riley. Riley Beggin: Many people in our audience wanted to know about taxes, insurance, and finance issues. From our audience member John, “Do you believe that economic development deals with tax credits, incentives, etc., are necessary and useful for Michigan’s communities?” What’s your position on tax incentives? Riley Beggin: Okay. You said decrease taxes wherever you can. Are you suggesting that you would decrease the Michigan business tax? Riley Beggin: Would you change anything about the business tax? Stephen Carmody: The economy’s doing well right now, but in all likelihood, we may be in a recession sometime in the next four years. Is there anything you plan to do as governor to position the state so that it will be able to coast out a recession better than it has in the past? Jim Hines: Growing the economy is key and having individuals that are educated in reading, writing, and arithmetic so that they can go to where the jobs are. And they can thrive. As businesses thrive and as individuals thrive because they have a job, not just a paycheck--a paycheck is nothing, but living from paycheck to paycheck, I guess is what I’m saying, is not a worthy goal. Stephen Carmody: Is there any place in the budget you want to save some money for the state’s new refrigerator, the state’s next vacation or any of the other things that the state needs to prepare for? Christy McDonald: Dr. Hines, I want to ask you kind of a bigger picture look at how you believe people perceive the state of Michigan when it comes to businesses who may want to invest here or want to move here. We’ve seen a couple of high profile bids. Foxconn ended up going to Wisconsin. Amazon didn’t even put Detroit or Michigan in their top 20. What would you think that Michigan needs to do to make itself look better for big companies to want to come here and invest? Sandra Svoboda: Do you think transit plays into that? We hear that a lot in the Detroit area. Younger people want transit to do not as much driving to get to and from work and other things; yet, we have a very diverse state, rural and urban areas that would inform any transit policy that you would have in the governor’s office. Could you speak to that issue? Christy McDonald: Erin has a specific question about auto insurance rates. Hassan Khalifeh: Yeah. I wanted to ask you about what you thought of the tensions between the United States and Canadian governments, Canada being the largest international trading partner with Michigan. How do you think that will affect your relationship with your counterpart in Ontario? Jim Hines: We’ve had an excellent relationship with Canada. Of course, we take 18 percent of their trash. Tariffs have a way of causing concern whether you’re looking at dairy milk or whatever product it is. There’s been a severe imbalance in import and export, and I think our president has been trying to address that. That’s created a lot of friction. I believe, however, that that discussion is really important. In the end run, we will be better off for it because there will be a balance there. The friction is going to be necessary for a while, but I believe that it will correct itself. Christy McDonald: Okay. Let’s take a look a little bit at transparency. Riley? Riley Beggin: What’s your stance on the ballot measure to create an independent citizens’ redistricting commission? And if you pose voters, not politicians, what would you suggest instead to fix the problem that some would say is gerrymandering? Riley Beggin: So change nothing? Sandra Svoboda: Michigan recently received the lowest rating among all the states in a transparency index for openness of government. I’m interested in what you would pursue as governor to maybe boost our rating in that, if you think that’s something that should be done, and I guess I’m specifically interested in the Freedom of Information Act and campaign finance disclosures? Christy McDonald: All right. We just have about five, six minutes left. We want to get to a couple more questions, so, Steve, I’m going to go to you for the medical marijuana question. Stephen Carmody: Actually, I want to focus more on recreational marijuana, since we’ll be voting on that in the fall. Michiganders voting on recreational marijuana this fall. What’s your opinion? Do you think that that should pass? Are you against it? If you’re for it, why? If not, why not? Christy McDonald: All right. You know what? We’re going to move to the fun question part. I think everything’s been fun so far, but we’re going to kind of end up on a little bit of a lighter note and just get some rapid-fire questions here and get your answers. We’re going to start, Erin, with you. Erin Einhorn: All right. Well, my question is what is the make and model of the cars that you and other members of your household are currently driving? Jim Hines: Wow. Ford Escape 2014, the Hines Mobile, which is an RV. It’s my mobile office. It’s a Ford 450, and then I have a son who drives a Chevy. All my kids? Erin Einhorn: Well, the ones who are currently in your household. Jim Hines: Oh, okay. So that would be it. Sandra Svoboda: I’m interested in who your favorite Michigan authors are and also your favorite Michigan foods. Jim Hines: Oh, wow. I like tart cherries. Jim Hines: Very healthy. Favorite Michigan author? There’s an author at Houghton Lake. I haven’t read the book, but it’s a mystery writer out of Houghton Lake. Shaker’s is one of my favorite restaurants, and they have him on the counter. There’s about ten. Patrick Jones or something like that. I haven’t read the book, but I would say--I love mystery books, so if I were to read those, that would be my favorite Michigan author. Hassan Khalifeh: I just wanted to go back to the race a little bit. Can you recall an interesting or touching moment along the campaign trail while talking to voters? Jim Hines: Yes. Can it deal with me? Riley Beggin: What are you reading right now? What’s the book on your nightstand? Jim Hines: The book on my nightstand? It’s called “Seven Men” by Eric Metaxas. It lists seven historical figures. He also wrote a book “Seven Women,” but I’m reading “Seven Men” now. It’s actually been a couple months since I have been in that book. Winston Churchill was one of the men, of the seven. Stephen Carmody: What makes for a good weekend? If you’re not on the campaign trail, you’re just having a weekend. When you think about it, what would you like to do? Jim Hines: I love to sit around the campfire, so we have a little place Up North. And just having a campfire, it’s on the lake, just sitting there, roasting some marshmallows. Christy McDonald: What was your first job? Jim Hines: I was a paper boy, age 12, and I learned so much because I learned that if I didn’t put the paper where it was supposed to be at the right time, I didn’t get a tip. Christy McDonald: And how long were you a paperboy? Jim Hines: For one year. Christy McDonald: All right. That is going to do it. 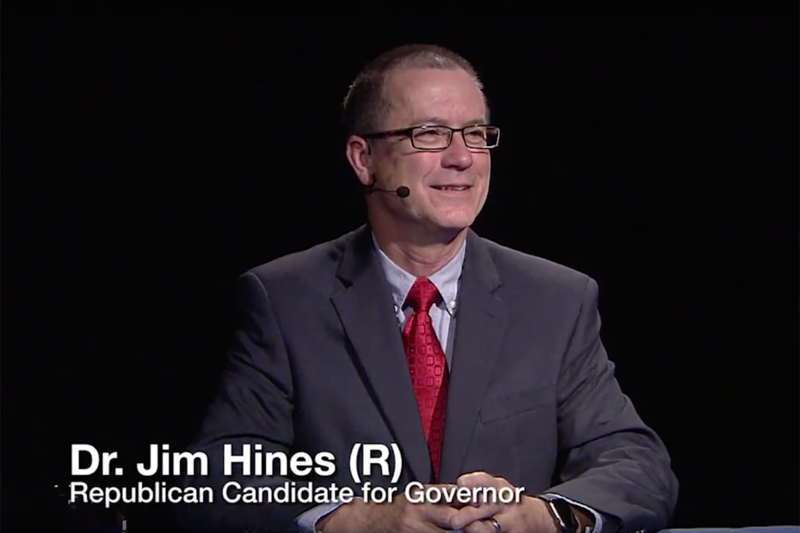 That concludes our conversation with Republican candidate for governor, Jim Hines. Dr. Hines, thank you so much for joining us. Many thanks to the John S. and James L. Knight foundation for its support. On behalf of the Detroit Journalism Cooperative, I’m Christy McDonald. Thanks so much for joining us. Jim Hines: And thank you so much for taking the time out of your day to be here. Really good questions. Thank you so much. I appreciate it. Christy McDonald: Thank you. That will do it.